When it comes to cleaning your home, you can spend hours doing that chore, or you can have a few tricks up your sleeve and finish with certain things, that would take you hours, in just a couple of minutes. Use these tricks to finish cleaning your home just in time to enjoy the rest of the day. This little gem can help you shave off tons of hours when it comes to cleaning. Vinegar is cheap and accessible in every store, so you can basically get it anytime you need it. And much more! Just make sure you don’t use it on stone floor tiles, hardwood floors and on dark colored clothes that have hard to remove stains. Muriatic Acid is a solution of Hydrogen Chloride (HCl) in water, which is also known as Hydrochloric Acid. This product is the strongest thing you can use on cleaning rust of metals, scale build up on ceramic furniture and on tiles. If the stains are old and require more work, just leave the acid on the stain for about 10-20 minutes, and by then it will be easier to clean it. But a fair warning, use the correct PPE. You need to protect your eyes and your hands so you can protect yourself in case this product splashes on you. The acid will remove all dirt, all mold and grime build up, and the oldest of scale build up will be a piece of cake for it. Just make sure you rinse it good after so there is no leftover residue to eat away at the material. 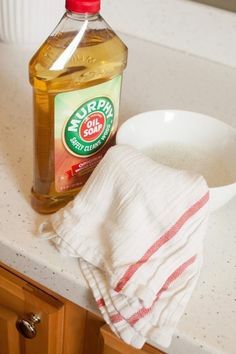 Make cleaning your wooden cabinets (and other wood in your kitchen) easy with Murphy's Oil Soap.